Whole Foods SLU has $2.99 per lb asparagus right now so I couldn’t resist! 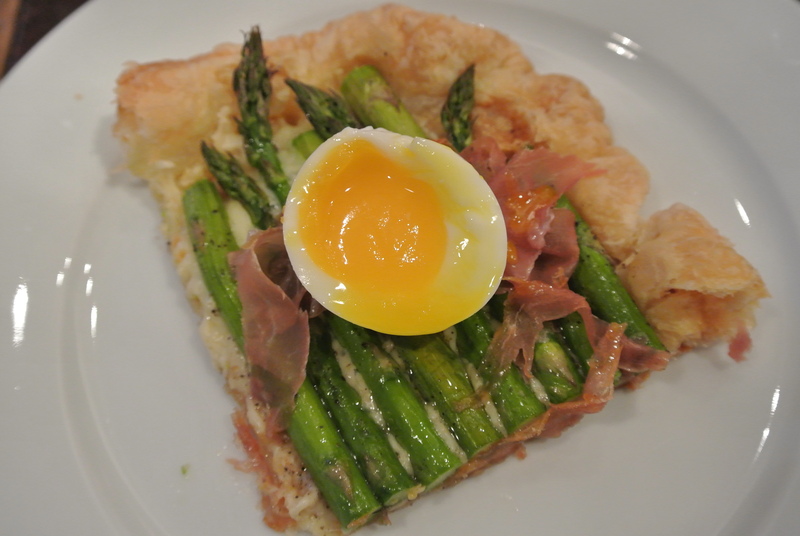 I actually picked it up a few days ago with no plan in mind and then it came to me- an Asparagus Gruyere Tart. 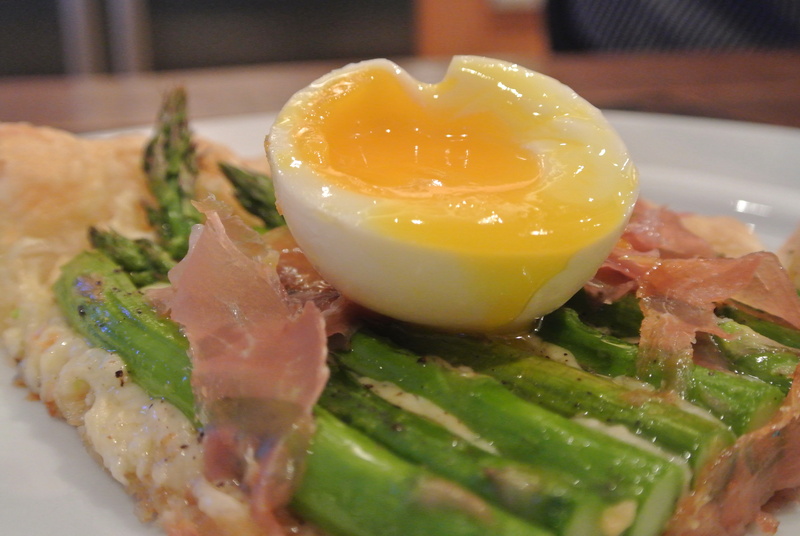 Couldn’t stop there so I added a couple of my favorite things- prosciutto and soft boiled eggs…. 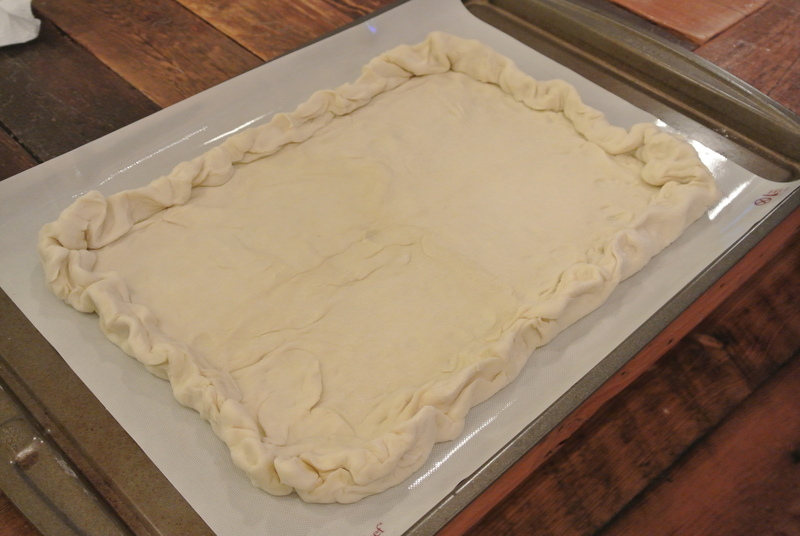 On a floured work surface unwrap and lay out your puff pastry. You may need to take in account time for defrosting (2-3 hours in the fridge). Flatten the pastry out in a rectangle shape and fold over the edges like you would a pie crust. 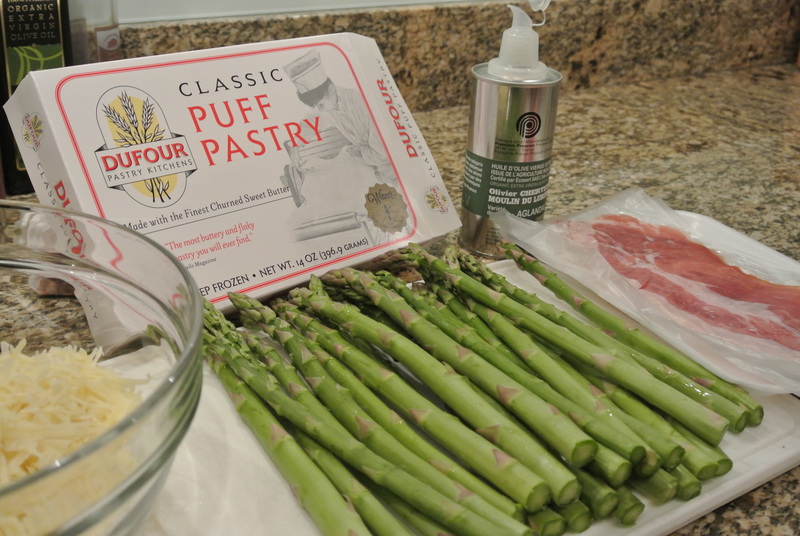 Then use a fork and poke the dough all over- if you don’t, the dough will….puff. We are not making a puff-tart people! Say that 10 times fast. hehe. Anyway, put the pastry in the oven and cook for about 15 minutes until golden brown. 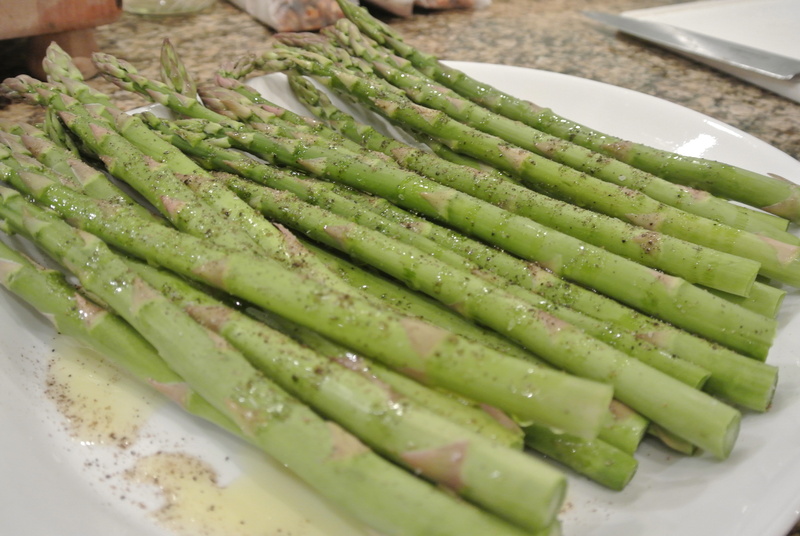 While it is cooking, prepare your asparagus (cut off the stems) and place in a flat bowl. Drizzle olive oil on top and then salt and pepper to taste. Mix to coat. Shred cheese. You can also use Emmentaler or Fontina cheese instead of Gruyere if needed. 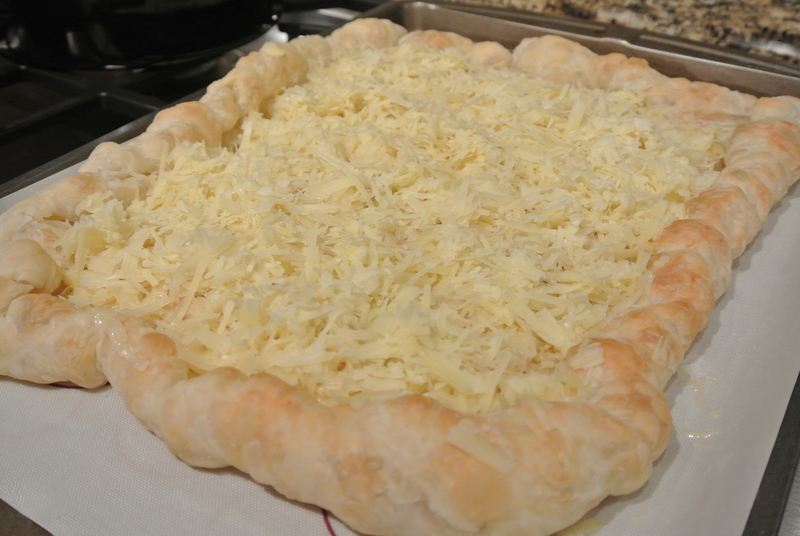 Remove the pastry and sprinkle the cheese on top. 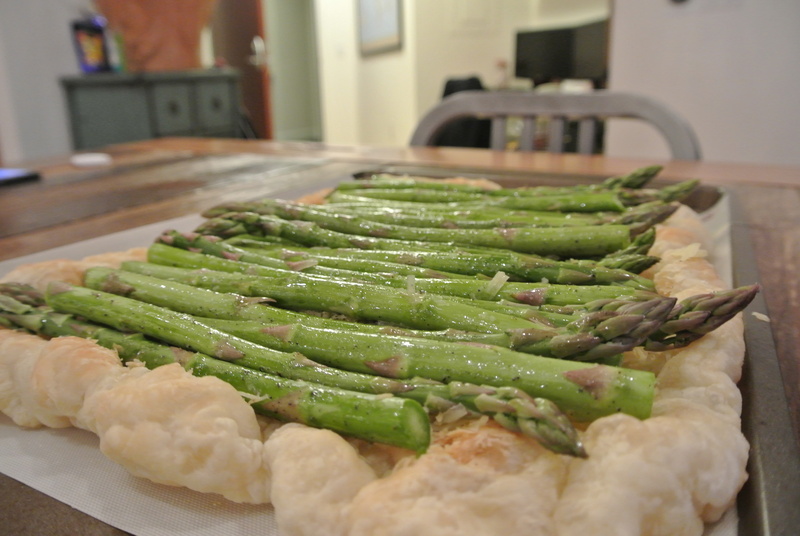 Then neatly arrange the asparagus while using a brush to coat the asparagus with the oil leftover on the bottom of the flat bowl. Pop in the oven for another 18-20 minutes. About 5 minutes prior to removing the tart, start boiling your eggs on high heat. As soon as the water starts boiling, set the timer for exactly 3 minutes. Allow the eggs to boil and then quickly remove from the heat and rinse with cold water. Keep in mind, everyone has a different stove…so boil times may vary. This is just how I cook my eggs on our gas stovetop :0) Peel and set aside. Remove the tart from heat and place it on a cooling rack. Let it cool for about 3-5 minutes and then transfer to a serving plate. 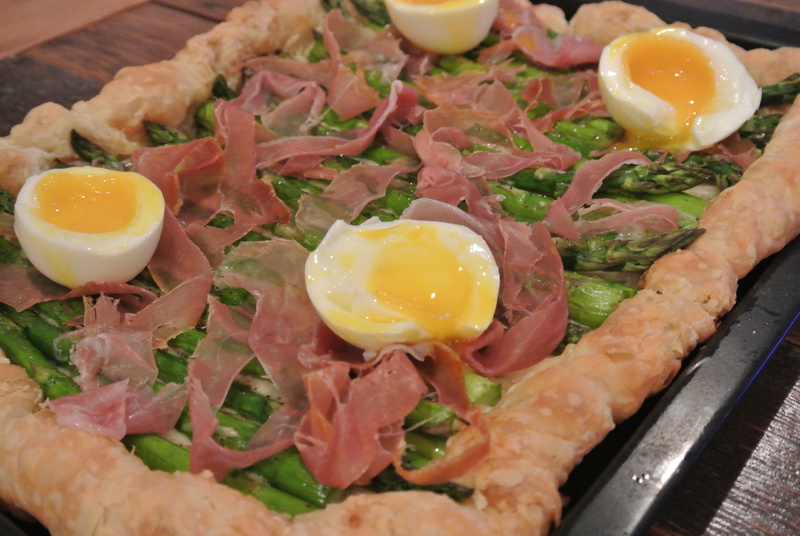 Tear pieces of prosciutto and place on top of the asparagus, cut both eggs in half (very carefully) and place on top too. Serve and enjoy…great with a white wine!